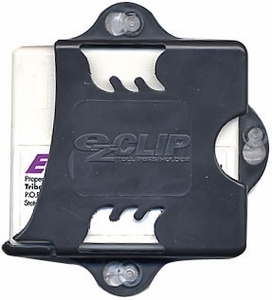 If you have an EZ-Pass, then you need the EZ-Clip! The EZ-Clip allows you to firmly mount your EZ-Pass to your windshield without using permanent Velcro adhesives. Instead, EZ-Clip attaches with dual suction cups, so it's easy to install, easy to remove, and easy to switch between vehicles! Toll authorities require that toll passes be firmly affixed to your windshield, not hand-held. Avoid risking a violation! EZ-Clip is made from lightweight UV resistant ABS plastic and comes with a lifetime guarantee. A perfect fit for New York, New Jersey, Pennsylvania, Delaware, Illinois, Massachusetts, Maryland, South Carolina and Virginia EZ-Pass Note: EZ-Clip is a registered trademark of E-Squared, Inc. and is not affiliated with any Toll Pass Authority. The above picture is a representation of any Mark IV Toll Tag.